Revelation is a band which plays classic rock music from the late 1950s through to the 1980s. We started playing together at St Cedd’s Church, Stifford Clays, Essex and we now perform a wide selection of rock music at local fetes and fayres, private parties and charity concerts. Current members of Revelation are Andy Sentance (bass/vocals), Ann e Sentance (keyboard/vocals), Mick Holland (guitar) and Peter Stephens (drums). Tim Sentance (sax) occasionally joins us at gigs. Andrew Ingram stood in as a guest guitarist in June 2011 and Peter Cook joined us at a charity event in Orsett in May 2014 (see photo, right). We played most recently at a charity event at Orsett Golf Club in aid of St Luke’s Hospice Basildon, on Saturday 31 May 2014. This was a very memorable performance. Our friend Peter Cook – an entertaining and gifted lead guitarist – was able to join us and we performed a few rock classics with him, including All Along the Watchtower and Deep Purple’s Smoke on the Water. The audience was fantastic, appreciating our blend of classic rock music, especially Peter’s guitar solos which included playing behind his back and with his teeth, a la Jimi Hendrix. 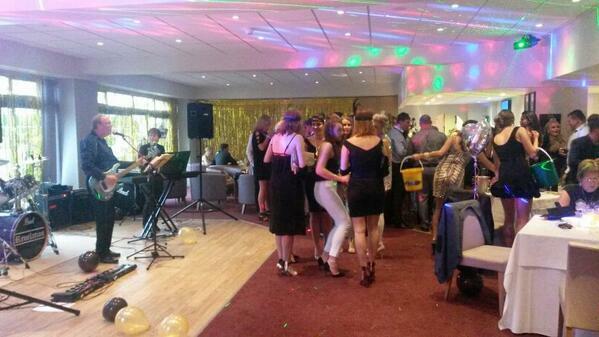 And we helped raise over £2,000 for the hospice, thanks to the generosity of the 100+ people who were there. You can watch a highlights video of the event here and also our encore, Purple Rain, complete with luminous drumsticks and outrageous guitar playing from Peter! Revelation: Keep on Running (Spencer Davis Group); She’s Not There (The Zombies) I’m a Believer (The Monkees); Light My Fire (The Doors); Brown-Eyed Girl (Van Morrison); Long Train Running (Doobie Brothers); All Shook Up (Elvis Presley); No Matter What (Badfinger); I Can’t Get Enough (Bad Company); Since You’ve Been Gone (Rainbow). Wonderful Tonight; Just The Way You Are; Wipe Out!